Pattern: Child’s First Sock in Shell Pattern, Knitting Vintage Socks by Nancy Bush. To be perfectly honest, I didn’t follow the pattern. I used the pattern repeat, and incorporated it into a sock of my desired dimensions. The recommended cast-on, cuff and number of repeats? Don’t know anything about them. The heel, gusset, toe, special instep instructions? Completely ignored. If I paid attention, I’d have to modify them anyway because my Grandma’s feet are long and wide. Needles: INOX aluminum dpns, set of 5, 2.5 mm (corresponds to US 1.5, although they were marked US 2 on the package). Yarn: KFI Cashmereno, 55% merino wool, 33% microfiber, 12% cashmere, color 01. 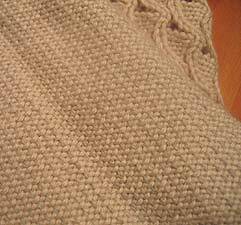 I had 3 skeins left over after knitting my Mia Shrug, and now I’ve used them up – destashing! I was worried about running out of yarn, especially considering my Grandma likes to have the leftovers for darning. I think my worries were justified – I only had a tiny bit left over. As before, I wove in reinforcement thread into the sole of the sock. I have no idea if this helps even one bit, since my Grandma is reluctant to say anything other than, “they’re perfect.” But I keep doing it anyway, hoping it will allow socks made out of buttery yarns last longer. Things I would change next time: I’ve already knit a pair of socks out of this yarn using these same needles, but those had cables and ribbing in contrast to this very lacy pair. As a result, I feel this pair is much looser, and I think were I to knit this pattern with this yarn again, I would go down a needle size to create a more dense fabric, comparable to the fabric I got last time. 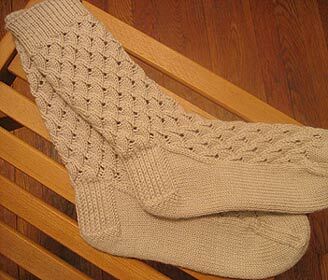 Also, I would make the two socks mirror images of each other – so that the “scales” swoop to the right on one sock, but to the left on the other. That would be cool! Oh it’s so perfect, but can you write it all over again for me? I’m a genetic mutant with feet the size of small buicks, but I’m sure it would be no problem for you, right? They look great! I love that shot of the socks in bed! I love them…the pictures are really neat too :). Gorgeous! The photo is VERY cute too. they are so beautiful. your nan will be thrilled! great socks! grandma will love them (although i get the sense that like all grandmas, she’d love them just because you made them!). btw, i struggle with the same fit issue with socks with a lace pattern on them. they seem to stretch forever and ever! i’m about halfway through the foot of a sock (toe up) with lace and i think i’m going to rip and go down a needle size myself. Sooo Fabulous! I hope to be able to knit like you someday. Wow, they’re absolutely gorgeous! I’m sure your granny will absolutely love them! Those are beautiful socks. Lucky grandma! Beautiful! Love the photographs. My Jaywalker socks are done, by the way, and I LOVED the pattern. Thank you! Woot! They look great. Can you get a picture of Grandma’s feet in them? Beautiful, beautiful socks. Grandma will love them. I TOTALLY want to copy cat you now!! hee hee–I miss-read what you wrote and I thought you said that the scales DID swoop in opposite directions. they are beautiful, of course, and they must be the softest socks ever. They are gorgeous! I can see a pair in black for myself…hmmmmm. I must try the reinforcement thread in the sole idea, it sounds like it should work! The socks came out great! I love that pattern. Nice job on the socks. I enjoy seeing an inventive knitter at work. 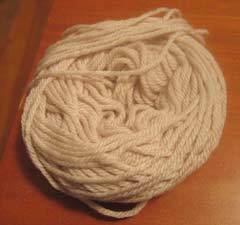 As long as I’m ruminating, the other thing I’ve heard (but also not tested) is that the number of plies has more effect on yarn longevity than the degree of twist. Can you tell that I’m working on developing the “perfect” sock yarn and have more than a few prototypes in my brain? Ooooh, lovely (and that picture is perfect). Your grandma is one lucky lady. I love the simple color with the elegant pattern. Another check in the “win” column. Woooo-hoooo!!! Another pair of beautiful socks done!! Beautiful socks and such a cute pic. I know your grandmother will love these! Nice job there, Kathy! I just cast on for these socks last week … and immediately ripped them because my attention span is so short lately. This isn’t really a “moderate-two-children-and-keep-the-lace-pattern-intact” kind of sock. I’m instead working slowly on one of those ribbed socks in the front of the book. Isn’t this a fun book? Take care. Beautiful socks, and I love the boudoir photo shoot! I can’t wait to get my hands on this book…it’s taking forever to come in at my LYS. Your work is an inspiration, as is your patience with all that reinforcement weaving in! You don’t need another comment saying this, but they look great! Grandma is going to love them. Lovely lovely! I haven’t used any reinforcement thread … wonder if they really help too! So great. I love that you threw caution to the wind and just did it. Lovely. They are beauties. I was thinking they looked like something buttery or creamy! Nice job. Gorgeous socks! I do wish your grandmother would tell you if the reinforcement worked or not. I’d love to incorporate it into my socks, but so far haven’t gotten the motivation to actually do it. But really, I mirror-imaged on the Cool Cagoule, so why not here? Hehe. Anyway, I love these socks in sportweight and in oatmeal. 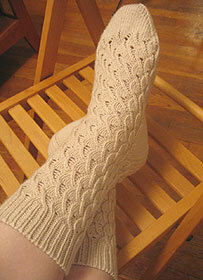 As for making them slightly denser, I typically go in about 1/2″ in terms of gauge when knitting a lace sock. But yours look like they fit perfectly, so I wouldn’t worry about it. As usual, another impeccable FO. I’m a foot outside the blanket person myself. The socks are lovely, but darn you for being clever and modifying them so much that I could never hope to achieve such beauty myself unless I got a grumperina brain in a transplant operation. Thanks for the tutorial on picking up stitches the pretty way. So, so pretty!!! And fun pictures too. this is a gorgeous pair of socks! i love it. Just LOVE those socks – thanks for sharing “the pretty way…” I haven’t done my heel flap yet on my current pair, so when I get to the picking up stithces I am definitely going to try it! There’s another Cashmere/Wool blend sock yarn you need to know about. Butter, as you say. It’s Lana Gatto VIP. Absolutely divine. And it comes in great colours. Put it on your wish list. Gorgeous! Your grandma will love them! Such beautiful socks! And good idea about the mirror image thing. I like those little design details. So pretty. I love them! I absolutely love these socks. I NEED to get myself that book. Yours are fabulous. You should get a commission check from Nancy Bush. Because of you & your Grandma’s feet & your picking up stitches the “pretty” way I HAD to go out & buy this book. They are beautiful. Thanks for the inspiration!